- OK this makes no sense now - when I posted this, the word of the day was shimo - frost. Today, it's musume - daughter, and I definitely will not need that word - ever, not just for a few months!! Another book I nearly gave up on. But so glad I didn't. The only thing I knew about Cloud Atlas was that the movie didn't get such good reviews. But the article I read about it in Newsweek must have sparked my curiosity, and I downloaded a sample of the book onto my Kindle. When I started reading it, I felt disoriented - I didn't know what period the story was set in, nor if it was based in reality or complete science fiction. I didn't even know if it was set on Earth! I very nearly didn't purchase the rest of the book - but by the end of the first chapter, I was committed (great marketing ploy, this "try a sample chapter for free"). And chapter after chapter, I got more and more hooked. I loved the stories, their connections, the structure of the book, and how it holds together. Hard to imagine how this can successfully be transferred to the big screen. I strongly recommend to read the book before you watch the movie - it's a wonderful experience. And if the movie is good, that will be an added bonus - I've looked at the movie website, and it looks interesting, but maybe confusing - more connections than I can handle. But the score sounds wonderful! Will have to wait until BB has read the book before we watch it, though. I was expecting a lot from this book, and it surprised me. At first, I was disappointed that it wasn't a romantic family saga. I had visions of historical fiction, drama, war and peace, stories of love and derring-do, the whole lot. But it was actually about the author, Edmund De Waal's search for his ancestors' connection with their collection of netsuke, beautiful little Japanese statues that you can hold in the palm of the hand. Through this central theme, the story was told of his ancestors - prosperous grain merchant in Odessa, art patron in Paris, banker in Vienna, holocaust survivors, businessman in Japan. Because of my exaggerated expectations, it took a while to get into it. But I did love this book in the end. And I would certainly like to see the locations next time I'm in Paris or Vienna, and Tokyo of course- though it's unlikely I'll be going to Odessa any time soon! And I would also be tempted to go to the Ephrussi de Rothschild villa and gardens near Nice, although the owner of the villa only gets a passing comment in the book! 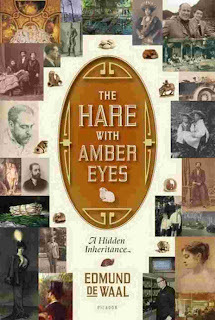 If you're interested in early Twentieth century history, The Hare with Amber Eyes's sweep will make you want to know more. For a look at samples of the netsuke collection, do click this link to Edmund De Waal's site. They are such a treat. Fascinating how they survived the war! Not a light read, but well worth the initial effort! Actually, it's an orange-red, or at least that's how it looks on the RTE Player on my computer. This style of dress is quite flattering, isn't it? Siobhan Ryan bringing us a bit of sunshine with this orange-yellow dress! I'm in between books at the moment, and I still can't access my art room, so taking the opportunity to draw more, on paper and on my iPad with Paper. 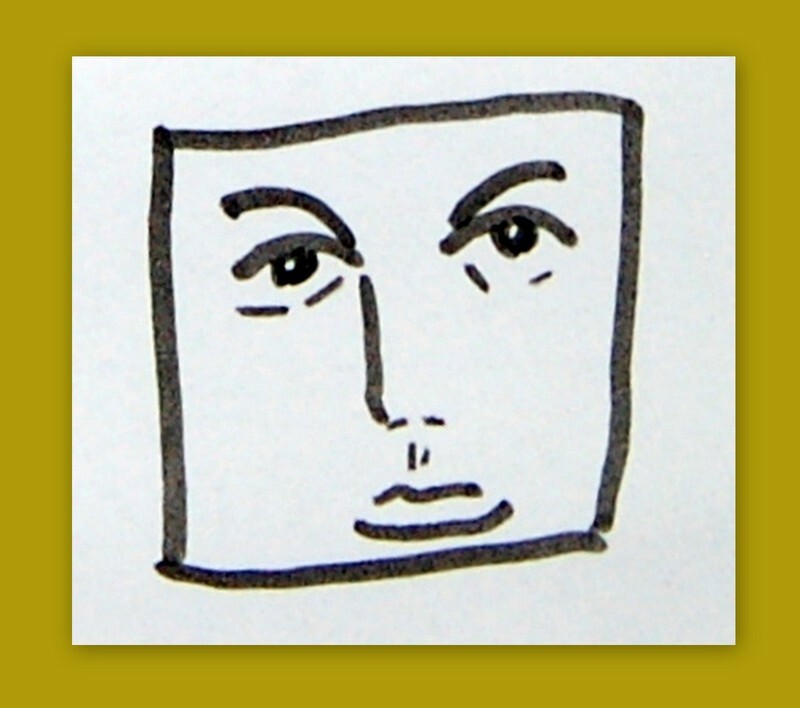 For years, I felt that if I couldn't draw an accurate representation of what was in front of my eyes, then the resulting drawing was no good. I'm slowly coming to the conclusion that it doesn't matter - if I enjoy the process and if the result is pleasing to the eye, there is nothing wrong with that. I'm not planning to sell any of my drawings, so why beat myself up about it? And if the stamps on colourful backgrounds don't work out, I can simply go back to drawing, black on white or white on black. 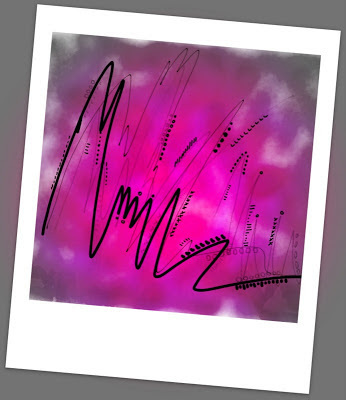 Another heat map view of the same little drawing - I think I just inverted the colours in Picasa. I see an idea for a journal page in this. Lovely red-orange background, golden circles in different patterns on the page. 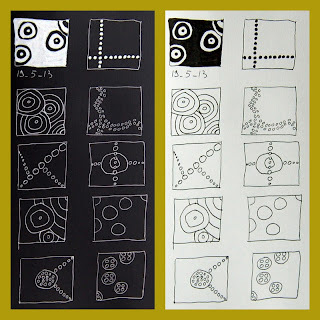 These could also be good simple-but-striking patterns for stamps? I did my first drawing in this sketchbook in 2010. Finally reached the last page yesterday! The penultimate page is full of squares, in which I've drawn circles. Great fun. Very relaxing for the brain! And made so pretty in Picasa with the Heat Map tool. You know me, once I find something new, I have to keep exploring. 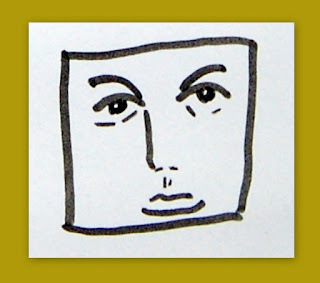 Here is a little face done using good old markers on plain paper in a sketchbook. Will I call this one Grumpy or Sad? Maybe Bored? There is a series of three mini-movies on Netflix, by the same people who made Dead Set (a must see for Big Brother fans, but don't click if you don't like zombie gory details - you will never be able to look at Davina McCall without these pictures in your head!). I think it's called Black Mirror. If you get a chance to watch these, they are well worth the time. And I've just seen that there is a second season. Looking forward to it! The Entire History of You (one of the three mini-movies in Black Mirror) takes the idea a step further - we're in the near future, everything looks familiar - cars, houses, furniture, clothes - but everybody has a memory chip implant that gives them perfect recall - they can rewind their memories, pause them, zoom in. We're now in a world where you will not have a "he said, she said" situation - all you have to do is rewind to the timestamp, and you can replay anything you saw last week or last year, a job interview, a dinner party, your baby's movie of an evening with the babysitter, or a sexual indiscretion you'd rather forget. Not only can you replay just for yourself, but you can also display the "memory movie" onto a larger screen for other people to watch! Maybe a good idea if you're suffering from memory loss.... But after watching The Entire History of You, I don't think I'd like the implant. Scary world! Quite a different style from Jean's usual - muted colours, short sleeves. I like the idea of it, the sleeves in particular are very flattering, but the overall look lacks a certain je-ne-sais-quoi. PS: really hard to get a good screen shot - there is an annoying Lyons Tea ad that pops up every time I pause the RTE Player and when I close it, a black square remains over the centre of the shot. I wish RTE gave their viewers the option to skip the ads on the Player! Can't access my painting room right now, so let's share some variations on the good old theme of the tree! Lovely atmospheric book, this. I enjoyed it a lot more than Redemption Falls, though that was a fine book too, but maybe too masterly, too intellectual, too contrived. I felt pride at the achievement of reading it through, rather than real pleasure. Ghost Light is definitely a simpler construct. 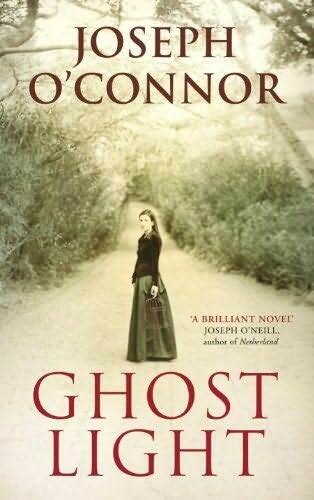 A piece of historical fiction, based on the life of John Millington Synge and told in the voice of the love of his life, Molly Allgood, reminiscing about better days. There is a lovely hazy feeling to the memories, as Molly has taken to the bottle, and her thoughts are not following a linear pattern. She is stumbling through her day, on an empty stomach, from her cold room, through the streets of London, as she remembers her youth as an actress at the Abbey Theatre, where she crosses the paths of Lady Gregory, Yeats, and Synge. She was a young, Catholic, lively girl from inner-city Dublin, far from his gentry background and big Glenageary house. Their love affair had to be conducted in secret, as his mother did not approve, and he did not seem inclined to confront her. He succumbed to illness before they could get married. Ghost Light is a story of impossible love, missed opportunities, and a life of regret. I found it beautiful and dreamy. The only thing I found annoying is the music playing on Joseph O'Connor's website. And it took me a long time to find the button to turn it off. Just as well I'm not working in an open office! Three defining moments for me in Die Walkure at the Met HD, shown on SkyArts2 (2 more to go!). The ride of the Valkyries, of course. Such a well-known piece of music. And an imaginative use of the set, as horses for the riders. Hojotoho! Wotan setting fire to the mountain around Brunnhilde. So sad and so beautiful. Fricka's scene - is it me, or was the floating chair scene inspired by Q's in Star Trek TNG's "All Good Things"? Ok - Number 3 is probably not the most commented-on by Ring aficionados. How many people are Wagner fans and Stark Trek The Next Generation fans too? Am I all alone? 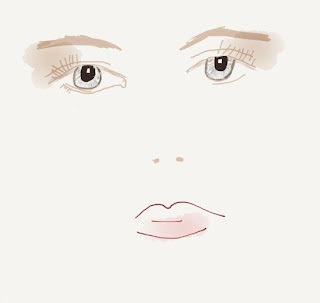 Just discovered the Paper Zoom tool - I should check my Twitter more often - and I've enjoyed doodling with it. Nothing too meaningful, but I had fun playing with shapes and marks. I do like the colour of this dress - an orangey red, which really suits Siobhan. And it's a very neat cut. I'm not 100% sure about the gathering of fabric on the left shoulder, though. I'd like to see it again to make up my mind! How did I miss that one? Jean Byrne was wearing a very interesting dress on Saturday night - I'm not sure what material it's made of, but from here, it looks like mock-snake-skin. Beautiful cut. And perfectly enhanced by a satin green belt, and no jewelry. With such a statement dress, you definitely don't need any accessories. Very flattering dress, square-cut at the front, with short little sleeves, worn with a thin belt and minimum jewelry. I often see people on my blog who were looking for Aine McAteer's website. 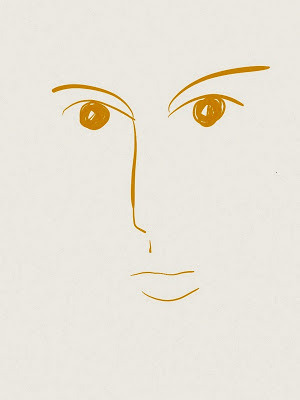 Here is her lovely new blog: ! I think I'm going to go and find myself some nice lotus roots! 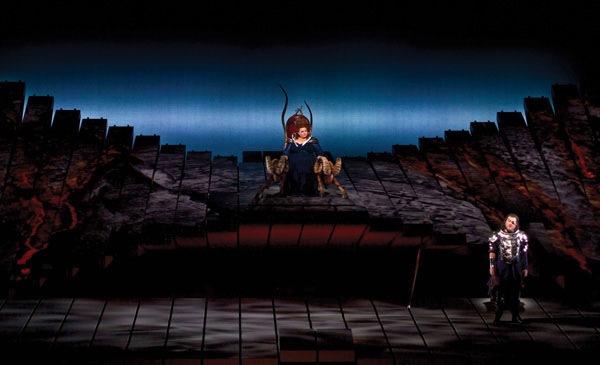 Sky Arts 2 have been showing Wagner's Der Ring des Nibelungen for the last couple of weeks, from the Robert Lepage production for the Metropolitan opera, New York. I had seen Gotterdammerung, the last of the cycle, at a Met HD screening last year, my first Wagner opera, and I loved it. So I thought it would be interesting to watch the first three operas. Das Rheingold was such a delight! OK, Wagner is not quite as entertaining and charming as a Mozart opera, but beautiful beautiful music. And I am a big fan of the Lepage Machine! How the opera starts with a plain blue line representing the Rhine, and how the Rhine maidens were floating, with bubbles appearing when they sing, and then pebbles rolling as they move. And how Wotan and Loge are walking at a 90 degree angle from the steps leading them to Alberich's cave. It's so simple, quite abstract, and yet I find it conveys the emotions of each scene so well. I'm looking forward to the second part, Die Walkure, which I taped last night. 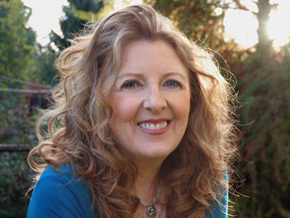 Can't wait to see Deborah Voigt, who sings Brunnhilde. She was amazing in Gotterdammerung. Some people may feel that the machine has taken too large a role in these operas. Personally, I love it. It's a bit like Cirque du Soleil versus an old-fashioned circus - it brings new life, and new audiences, to it. It may not be to everybody's taste, but, let's face it, without it, the art would die from lack of interest, and funding. And don't forget to browse the Met's Ring mini website. The videos were a bit laggy when I was watching them at the weekend, but they're well worth it. Gorgeous colours - I must try and mix those reds. If you didn't mind the crazy amount of blood spilled in Seven Psychopaths, then you'll love Django Unchained. Quentin Tarantino's take on slavery in the Deep South, or the Far West, not sure which. I wasn't a fan of Reservoir Dogs - its violence was too dark for me; I couldn't take it. But Django Unchained is a much brighter kind of movie. Plenty of violent deaths, including innocents, but there is something happy about it. 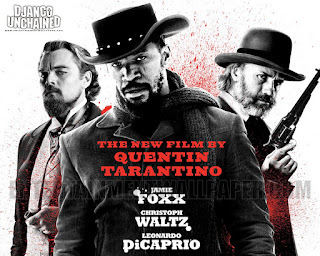 Django is a black slave freed by a bounty hunter who needs him to identify three criminals. Django proves to be a natural at the bounty hunting, and they work together for a while. But all Django wants is to find his wife and free her. Let's just say it doesn't end well for everybody, and Leonardo di Caprio is brilliant as the Southern landlord with a thirst for violence. You will never want to paint the hall red after seeing this movie. Just to give you an idea where I've been coming from with my previous post. I think this tree here, warts and all, looks better than the one in my finished painting. The top is too spidery, but the bottom half is quite convincing. So why did I go all abstract shapes? I thought it was a good idea at the time! But I don't really know what visual effect I'm after, so it's hard to know how to progress this. Generally, my better paintings have been ones where I have made the shapes simpler, so I thought I should explore that further, rather than try to go all naturalistic (I don't have the patience for naturalistic anyway!). But on the other hand, this little tree here to the left worked out ok.
Not quite sure how I feel about this one. Do the colours work together? Are the shapes too constructed? Is the effect too cartoony? I like the simplicity of it, and my eye keeps coming back to it. But do I fancy it hanging on my walls? 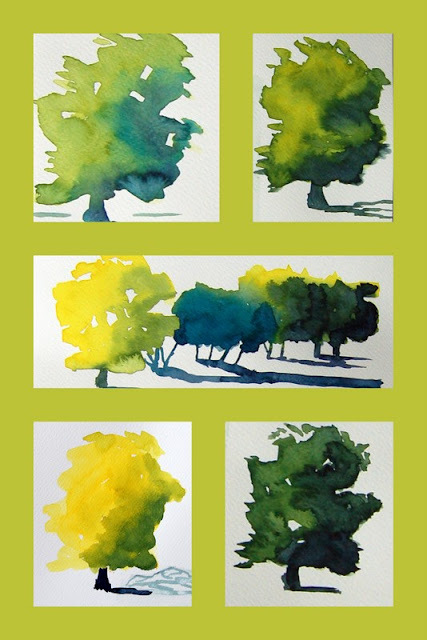 Green is never an easy colour - I used aureolin yellow and indigo for the trees, and indigo for the shadows. The low background is ultramarine - a vibrant contrast. But is the grass too green? Is it ever? Maybe cobalt turquoise and aureolin was too bold a combination? It's very hard to judge by a picture anyway - blue is a colour that doesn't transfer well to photograph, and I guess green is even worse. The original is nicer, believe me. I'll just have to stop agonising. And paint another one! Lovely sunny day in Dublin last weekend. (Not anymore - rain and wind and cold now). Monday was the perfect day for the Botanic Gardens. And I've just read that a pedestrian link will be built between the gardens and Glasnevin Cemetery, which explains why the wall separating the two had been knocked down. You learn something new every day. Looking forward to exploring the next time we're over. These waterlillies would make a lovely painting, don't you think? I wasn't sure I was going to like this one - what kind of a title is this anyway? But Seven Psychopaths was so much fun I couldn't resist it. It is a movie about making a movie - Colin Farrell is a script writer who's going through a dry patch - or more precisely a wet patch - he's drinking too much and writing too little. 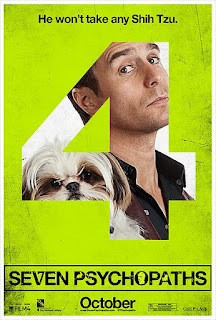 He's got a good title for his movie - yes, you guessed it, Seven Psychopaths - but so far not much of a story. Until his unemployed actor friend, played by the guy from Moon, what's his name again? 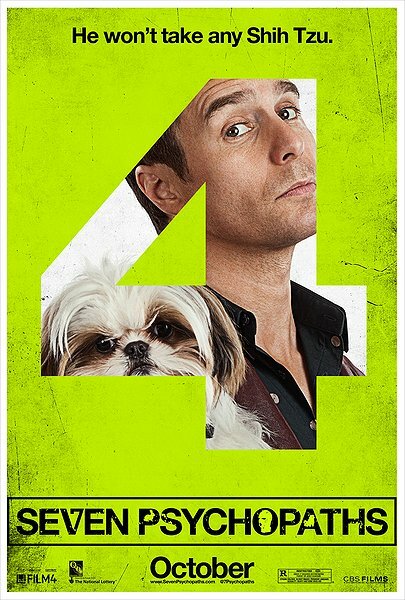 I really like him but I can never think of his name - Sam Rockwell! Thank you Wikipedia!, so, until his actor friend played by Sam Rockwell gives him a newspaper clipping about a mysterious killer, who only goes after middle-to-high-ranking gangsters and leaves a jack of diamonds card at the scene of the crime. There are plenty of twists and turns, lots of blood, and even an appearance by Tom Waits. Thoroughly enjoyable, if you don't mind a few gory deaths. Oh, and the dog is really cute. We were wondering if Jean took Siobhan shopping? An unusual outfit for Siobhan yesterday - is it a black skirt and top and a cadmium orange sheer sleeveless shirt? Not sure what to make of it. MHBD the domestic goddess has been baking again! How will we ever manage to lose weight at this rate? This one looks particularly yummy, doesn't it? And it tasted delicious, believe me. This is another one of Aine McAteer's new recipes that I'm trying out. A chocolate fudge brownie with no butter and no sugar. But very chocolaty all the same. I might bake it again over the bank holiday weekend. I think, this time, I'll turn my oven to a standard oven setting, rather than fan oven, as I'd like to achieve a fudgier consistency. I've been told that, apparently, a fan oven isn't ideal for baking as it can dry things out. You learn something new every day! This cake is full of goodness, as is always the case with Aine McAteer's recipes of course. I haven't worked out the calorie count yet, but it is definitely less than my very fudgy chocolate brownie cake. But that would not be hard!